Trimming nails is something you will have to get your Poodle used to. Most dogs need to have nails trimmed at some point. While the vet will often clip them for you, many dogs need their nails trimmed more often than that to prevent injuries and other problems associated with overgrown nails. You may find some Poodles are prone to brittle nails. Nails that chip and break off if left too long. You should start with Desensitizing those feet... This is easier to do when the dog is asleep. Start by resting your hand on the paw. If they wake up, simply remove your hand and act as if you didn't notice- don't even look at the dog. After a few nap interruptions (again, depending on the dog), you should be able to rest your hand on those paws indefinitely. Some dogs this takes from 1 time to a few weeks depending on the level of anxiety associated with getting their feet handled. Once they sleep though this, start lightly moving their toes apart, touching the toe nails, lightly tapping against the ends of the nails, expressing the nails forward from the nail bed, etc. Move in slow stages, and it'll go faster in the long run. Dogs have nerve endings and blood vessels inside their nails called a quick or "Kwik" as is often called. If you clip too much off, you will make the dog bleed, and make the next trimming session harder! If you do nick the quick, you can apply a product like Kwik Stop (a styptic power), or even jam the nail into a bar of Ivory Soap which will plug it up and stop the bleeding. When you do toenails, take the time to check out the dogs feet. Check the pads for cracks or cuts. Check the webbing for burrs, foxtails or thorns. Nail clipping—the mere mention of this task can strike terror in the hearts of many dog owners! Fighting a dog while wielding a sharp instrument is no one’s idea of fun, but it does not have to be this way. With some practice nail clipping can be a quick and painless operation! The best way to ensure that your dog will accept nail clipping gracefully is to start desensitizing him when he is young. Dogs tend to dislike having their feet touched, especially if they are not used to it. As soon as your new little fella moves in, start handling his feet. Your job is to get him used to it, and if not like it, at least tolerate it. When you are playing with or petting your puppy, handle his feet. Hold the paw, touch the nails and feel in between the toes and pads. Make the pup sit quietly while you do this, but keep the session short, as pups have short attention spans. Praise the pup as you are handling him and give him a little treat when you are finished for a job well done. If your dog is older, you can still work to desensitize him to having his feet touched. Just as you would with a puppy, hold his paws, touch the nails, and feel in between the pads. If he fights this, keep the session very short, just touching each paw briefly and giving lots of praise and a treat afterwards. With a very difficult dog, ask someone to help you by holding the dog still. Keep the session calm—a big fuss will only serve to reinforce the dog’s notion that paw touching is taboo. Build up the time that you can touch his paws over time. Eventually, he will not mind having you do it. Do not underestimate the importance of getting your dog used to having his feet touched. Even if you choose to have your vet or groomer clip your dog’s nails, your dog will experience much less stress if he is used to being handled. Also, if your dog ever has a foot injury, it will be easier for you both if you are able to examine his foot. Do not use scissors or human nail clippers on your dog. They are not designed for the task and can crush the nail causing your dog some pain. Your vet or local pet store carries several types of clippers designed for the dog nail. Make sure you have the right size for your size dog and keep the blade sharp. I don't like the guillotine type as it is harder to gage where you are cutting. I prefer the scissor style. In these you can place the toe nail and what ever catches as you draw away is the part that I clip. Its a good idea to let the dog get used to seeing the nail clippers. Bring out the clippers and lay them down. Do nothing with them, just let them lie there. Have them in a spot where the dog can't help but notice. Leave them out for a few days so the mere sight of them is no longer so upsetting. Some owners like to use a small grinding-tool to keep the nails short. These work well, but the dog must be used to them as the sound of the motor can be frightening. In case of bleeding, have on hand a styptic pencil or Kwik-Stop powder. These will immediately stop the bleeding when applied to the nail. A nail file designed for dog nails will put on the finishing touch. If left to grow too long, the dog’s nail will cause the toe to turn up and the dog will not walk on the foot properly. If you hear the nail clicking on the floor, it is time to clip. Nails that are too long can catch on things such as fabric and the struggling dog can hurt himself. Additionally, dogs with long nails can scratch their human companions. Many dogs have a dew claw, that is, an extra toe and nail, higher up on the leg on the inner side. These claws do not touch the ground and therefore do not get worn down at all. They can grow quickly and if left unclipped can catch on things causing harm. The nail can grow completely around if left unchecked. The dog nail has a blood vessel, or "quick" that extends part way down. If you inadvertently cut the nail, the dog will feel pain and will bleed. If you are lucky enough to have a dog with white nails you can easily see the quick, but if your dog has dark nails you will have to gauge how far down the quick goes. Before you put your dog on the grooming table, ensure you have your clippers, file and styptic powder ready. If your dog is unruly for the clipping, ask someone to hold him for you. If you have a small dog, use a table or counter with surface that will not allow the dog to slide. We use a grooming table and grooming arm and noose to keep their heads up and away from licking or biting range. Holding the clippers in your right hand (or left if you are left-handed), firmly grasp one foot and place the clippers over the nail. Make your cut at a 90-degree angle, about 2 millimeters from the end of the quick. If you cannot see the quick, try to gauge how far it will go down the nail and cut there. Usually, the quick will extend about �’s of the way down the nail, so you can safely cut about �, or up to where the nail starts curving. It may be easier to make two cuts if you are not sure how far up to go. If the dog’s nails are very long, do not be tempted to cut back too far. Cut just the end off and then cut them about every 7-10 days until they are back to where they should be. This will give the quick time to recede so that you are not cutting into it. If you do cut too far and the nail bleeds, don’t panic. It may be uncomfortable for the dog, but it is not life-threatening. Apply the styptic pencil or powder to the nail and waait a moment until the bleeding stops before letting the dog walk. Remember to clip the dew claws back as well and file each nail gently when you are done to smooth the rough edges. Reassure your dog as you progress. Use a calm voice and let him know that you are proud of him. When you have finished, give him a treat. With practice, you will be cutting your dog’s nails like a pro—saving you and your dog a trip to the vet’s or groomer’s! The nail grinder avoids the potential problems of cutting the quick, nails cracking, and sharp edges afterwards. 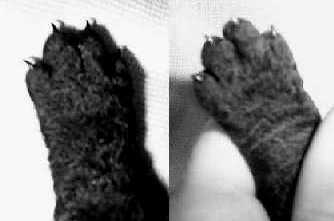 The nails can also be thinned, allowing the quick to recede, resulting in shorter nails and a tighter paw. RC Steele and other mail-order companies sell them for about $45. One model is the Oster Pet Nail Groomer, Model 129, with two speeds. Some dogs may be spooked by the noise. It may help to watch someone who knows how to use it first. Poodles have many different types of nails. I have heard people feeding knox gelatin to help the nails from being brittle. You have to get your dog used to nail trimming early, or you are in for a battle! Handle your new pups paws every day. Touch each nail, praise your dog, play with the webbing in between your pups feet. You do not want an 85 lb dog who will not let you examine his feet! This will be a battle that would be hard for you to win. I will be handling the pups every day, and holding feet, squeezing feet, touching toes. You have to keep this up.